The battle between Nikon and Canon flagship DSLRs has always been a fiercely fought tussle, with a steady release of pro-level cameras each improving on the other. In 2012, Canon pulled a rabbit out the hat and released the original 1D X – a camera that made quantum leaps forward compared to the older 1Ds MkIII. Four years on and Canon has released the latest version of the 1D X – the MkII. The latest big gun from Canon sees a good deal of improvement on its predecessor. A new sensor offers a jump in resolution from 18Mp to 20.2Mp. This may seem a low number when compared to Canon’s 50.6Mp EOS 5DS, but the 1D X MkII is built for speed. Talking of which, the 1D X MkII can call itself the fastest full-frame DSLR on the market because it’s capable of capturing 16 frames per second (fps) in Live View mode and 14fps in normal burst mode. The Nikon D5 shoots just 12fps. What’s more, it can capture up to 170 RAW files without the buffer filling and will shoot unlimited JPEGs. This versatility is attractive to sports and wildlife photographers who want to capture long action sequences, such as a bird of prey landing on a perch or a long-jumper arcing through the air. Other improvements to the MkII over its forerunner relate to video – the MkII introduces 4K recording capabilities to the 1D X line. Users can shoot 4K footage up to 60p, or switch to Full HD to capture up to 120p, so the recording can be played back in slow-motion. By increasing the pixels in the RGB sensor from 100,000 to 360,000 and progressing from dual DIGIC 4 to dual DIGIC 6+ processors, the 1D X MkII has the potential to meter exposures more accurately. While the native ISO range hasn’t changed (100-51,200), the expandable ceiling has increased from 204,800 to a massive 409,600, enabling photographers to shoot in low-light conditions. One area that has been drastically improved upon from the original 1D X is the autofocus system. The 1D X MkII has 61 AF points (falling short of the Nikon D5’s 151) – although 21 of them are the more accurate cross-type, whereas only one AF point was cross-type on the predecessor. In terms of build quality and layout of the body, the 1D X MkII doesn’t feature many changes from the 1D X. It’s built like a tank, is weatherproofed with more than 80 seals to keep out moisture and dust, and weighs in at 1340g body-only. That is a significant weight to shoulder, and if you were to add a large lens such as a 600mm to the equation, it would be wise to support the combo with a sturdy monopod. 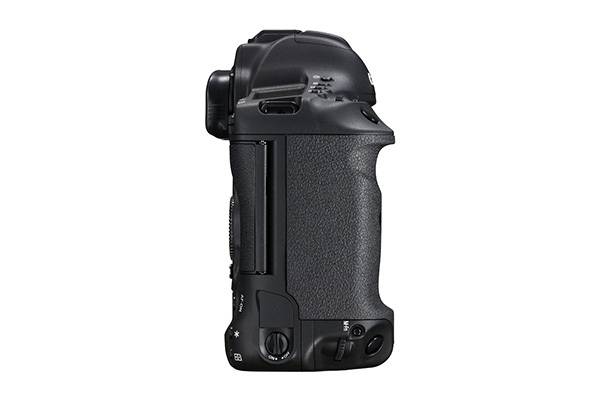 As a professional tool, the button layout on the top-plate differs to the familiar layout on other Canon DSLRs. There’s no exposure mode dial – instead there are three buttons to change the exposure mode, drive speed and metering used. Hold two of these buttons down together and you can change the AEB (Auto Exposure Bracketing) settings. This camera is built for speed, and the autofocus system is truly astonishing. It’s well worth spending some time working through the various AF Menu options before going out shooting, as presets can be selected to change the AF system’s behaviour for better results. For example, one preset will track subjects while ignoring obstacles in the frame, while another instantly focuses on subjects suddenly entering the frame. All this fine-tuning of the AF performance enables you to maximise your chances of capturing sharp shots of fast-moving subjects. When the shutter is pressed, the speed of the 14fps burst mode is breath-taking. To add a benchmark for this achievement, Canon’s EOS 80D – an impressive enthusiast-level DSLR – can fire off 7fps, making the 1D X MkII twice as fast. In action photography, every split-second sees huge changes, so the extra frames really could make the difference between a hit and a miss. The operation of the camera is aided by the additional shutter button and controls on the bottom right of the tough magnesium alloy body. This allows a more comfortable grip in portrait format. Images can be quickly locked to prevent them being deleted, and voice memos can be attached to files to record subject or shot details. An example of this would be a sports photographer adding the subject’s name to the captured image. During our tests, RAW files took less than 1sec to write, while JPEGs took just over 0.5sec. While always an important consideration, value for money is often less of a deciding factor to working professionals than enthusiasts, as the camera will be a business asset. Also with its unique standing, it’s a tough category to call, but at £5199, the Canon matches the Nikon D5’s price-tag to the penny. Buying a camera of this ilk is still a formidable investment, but Canon users will be getting the very best the brand has to offer. Built to take the abuse of professional use in harsh environments, and with a shutter rated to at least 400,000 actuations, photographers who need speed and reliability should feel reassured in their investment in the 1D X MkII. The Canon 1D X MkII represents the very pinnacle of how far the industry has pushed action photography cameras. If you make your living in this realm and already shoot with Canon kit, there’s nothing better you can buy – it’s simply remarkable. But this DSLR offers more than a simple upgrade from the original 1D X. It breaks new ground with the lightning-fast 14fps burst rate, and also offers enhanced 4K movie recording, which will have videographers salivating. The only real drawbacks of this model are price-related. At £5199, it’s only pro photographers and lottery winners who’ll get to experience its charms, but with its release, those with more modest budgets may benefit from a price-drop on the original 1D X. Overall though, the MkII is well worthy of its five-star crown. This review was first published in the June 2016 issue of Digital Photo - download back issues here.